Review: Funny, rambunctious, and different. 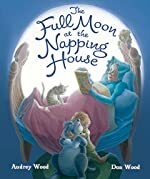 ÒEveryone is restlessÓ in The Full Moon at the Napping House in this sequel by Audrey Wood. That is until the cricket chirps a soothing melody, the Òfull moon song, that soothes the mouse, that calms the cat, who gentles the dog, who snuggles the boy, who hugs the granny, in the dreamy bed, in the full moon house, where no one now is restless.Ó You will find that each one of these characters has a different and unique personality. As a fan of the first book by Audrey Wood when I myself was very young, this is an adorable story of the exact opposite chain of reactions. In the Napping House everyone is disturbed and jumps out of bed while trying to nap. In a Full Moon at the Napping House a friendly cricket soothes them all like a childÕs lullaby. This is an awesome sequel that will be enjoyed by any gender as a bedtime story read from their parents. Children in preschool through kindergarten will love this book, the vocabulary is great for this age group, and as youÕll notice as you read through The Full Moon at The Napping House it is calming and humorous, and not complicated for the little ones. Review written by Sammy (6th grade student).